“At one time it was six, then eight, then ten people starting kicking my son,” said Margarito Martin-Torres, father of the victim. The South Bay teenager was beaten by about ten teenaged boys at the Cotixan Mexican and Seafood restaurant in Chula Vista Thursday afternoon, according to Chula Vista Police Department Lt. John Autolino. The fight happened in Chula Vista at the Cotixan Mexican and Seafood restaurant, Thursday afternoon. The victim only suffered minor injuries but, the family is worried nothing is being done to stop these teens' dangerous behavior. The victim’s girlfriend, who recorded the fight, said the two went to the restaurant after school, that's when the other boys started to enter the restaurant through every door. She says this all started a month ago when her friend was being bullied by one of these boys on the social media platform, Snap Chat. And her boyfriend stood up on Snap Chat for her friend. 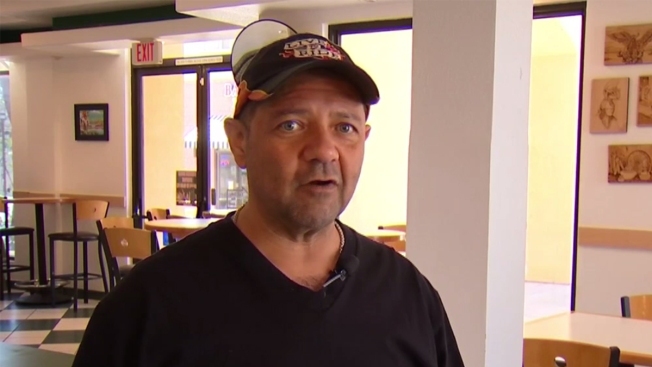 The restaurant owner tells NBC 7 that by the time employees saw the fight, the victim's girlfriend had already called the police. Chula Vista police are investigating this case as a robbery. Because the teens stole the victim's iPhone and Apple Watch. CVPD also said that they’re actively looking for all the people involved based on the cell phone video.A brutal beating was caught on camera over the weekend and now the family of the victim is searching for answers and justice. In a video that circulated on social media over the weekend, the group of mostly teenage boys can be seen punching, kicking and, at one point, throwing a chair onto the teenager's head. As he fell to the floor, the group continued to beat him up. Autolino said the teen was sitting in the restaurant with his girlfriend when the large group came in and challenged him to a fight. The victim's father said it appeared the group wanted to kill his son. "At one time it was six, then eight, then ten people starting kicking my son. They threw chairs at him," Margarito Martin-Torres said. CVPD said the teen sustained several injuries, including swelling to his face and body and shoe impressions on his face. "He fractured his arm, almost like someone hit him with a bat over and over on the same spot and shattered it," Martin-Torres said. "But I think God was on his side because he stood up." NBC 7 talked with the victim's girlfriend who recorded the fight. She said the brawl was the result of an argument that started a month ago on Snapchat when the victim stood up for a friend that was being bullied. "My son had said (on Snapchat) 'Hey, stop, leave her alone, stop doing this,'" Martin-Torres said. Martin-Torres said he was appalled the restaurant did not try to stop the fight or intervene in any way. However, the restaurant said employees did call police and try to help as soon as they were aware of the confrontation. Cotixan's owner, Marlon Espinosa, said he wasn't there when the fight took place but said his employees did step up to stop it. He said his employee working the cash register yelled out to a cook in the back who ran out to the dining area and confronted the group. Espinosa said he reached out to the victim and his family to offer an apology. He also said he wants to ensure this type of incident never happens again, and he plans on fixing his surveillance system and implementing anti-bullying response protocol for his employees. "We treat those kids as if they were our family," he said. "I treat them as if they were my kids, my own kids. I see them every day. I know what they like to order, who are friends." Espinosa said he and his employees are cooperating with investigators. CVPD said they are investigating this as an assault with a deadly weapon and a robbery because the victim reported his iPhone and Apple Watch were stolen during the fight.